It’s the golden hour of desert rock climbing—the fleeting moments before dusk when the sandstone crags catch fire and the cacti appear almost lush in the setting sun. It’s this blissful hour that I tend to relish. Each final pitch of climbing feels profound and magical when the light is low and dinner and a cold beer are close at hand. But this evening, the low light casts shadows at the base of the cliff I have just descended. There was nothing magical about my final climb, and I feel no bliss—only frustration and soreness in my forearms. 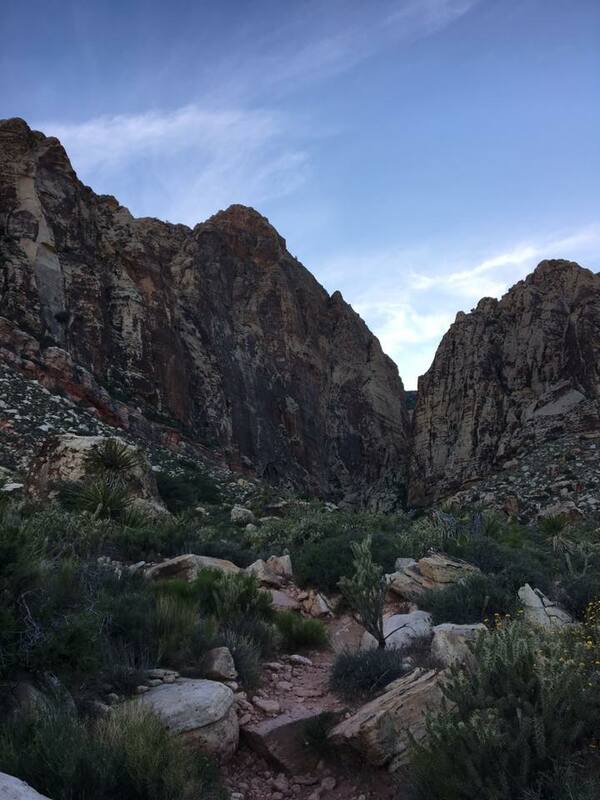 It is the sixth and penultimate day of our winter break trip to Red Rock Canyon, a mecca of sandstone peaks and endless climbing only minutes from downtown Las Vegas. From our campsite, a single beam of light shoots up from behind a nearby mesa, a constant reminder of the debauchery and tumult just miles away. My three friends and I have come not to gamble, but to climb. It’s a sport I’ve fallen helplessly for in recent years, and destinations such as Red Rocks are the reasons I hope to climb for the rest of my life. Right now, though, I’d be happy to not climb again for a few weeks. I sit at the base of “Glitter Gulch,” a pumpy 5.11a. For about a year I’ve tried to break into 5.11 climbing, and after a week of cruising 5.10s, I’d hoped for today to be the day. But after two desperate battles on the climb and many falls, my goal has never seemed farther away. I watch my friend Jack try Glitter Gulch on the top rope I had set up. I cheer him on and offer advice, but inside I feel a cold sense of validation as I watch Jack struggle on the moves. Earlier in the afternoon, tensions had arisen in our small group. Charlotte, my best friend and climbing partner, had decided to try and lead her hardest sport climb to date. I stayed behind to support and belay Charlotte while the boys, impatient, scampered off to a new area with the promise of meeting us soon. Charlotte sent her goal swiftly and impressively; I wished the boys had stayed to witness the feat. Instead, they were nowhere to be found. Charlotte and I spent the subsequent two hours scrambling over boulders in the scorching sun, calling our friends’ names only to hear our unanswered voices echo back across the canyon. Our phone calls went unanswered, too, and we grew impatient and sunburnt by the minute. Eventually, Jack and Ethan had wandered back to where Charlotte and I sat drinking water in the shade of a large boulder. They were oblivious to our annoyance, bursting with excitement over how rad the climbing was at Dante’s Wall. By the time we reached Glitter Gulch, my goal for the week, the sun was low and I felt drained of any motivation or energy that had fueled me all morning. As we pack our gear, I try my best to shake off my failure and enjoy the sunset. “We have a lot to celebrate today. Charlotte sent her first 5.10, and Ethan, too,” I say, feigning positivity. “And my first 5.11,” says Ethan, who had watched my struggle on Glitter Gulch from across the crag. The boys launch into a detailed description of their glorious first 5.11, but my mind races and I tune them out. I’ve been climbing for years longer than anyone in the group. I climbed my first 5.10 almost three years ago, but after today, 5.11 still feels far off. To climb both grades for the first time in a day seems impossible and wholly unfair. I try to offer words of congratulations, but what comes out of my mouth is bitter, selfish, and uncongratulatory. “Well, I’m glad you sent your first 5.11 before me,” I say, shoving my harness into my backpack. I hear my own hostility and try to apologize, but a sinking feeling in my chest gets in the way. Charlotte picks up on my disappointment and shoos the boys away. “We’ll meet you at the car,” she says. As soon as the boys are out of sight I break down. I know that I am a strong climber. Had I not just watched Jack flail on a toprope I had set with relative ease and higher stakes? And yet, I can’t escape the numbers. I feel a crushing sense of defeat in comparing myself to the boys. “It just doesn’t seem fair,” I say as Charlotte pulls me into a hug. I know she feels it, too. Jack and Ethan are among my closest friends, and I count them among the few with whom I would (and do) trust my life. Many of my teachers, role models, and dearest climbing partners are men. Most of the time, I’m unfazed by climbing with the guys, even if I am the only girl in the bouldering gym, or one of only five on our 30-member climbing team. But on days like today, when self-doubt gets the better of me, I can’t help but feel inadequate. I want so badly for my gender to play no role in my climbing, but I can’t seem to disentangle my identity as a female climber and be just a climber. The boys climbed 5.11 and I did not. I am scared of falling, but the boys don’t let fear get in their way. I want not to make excuses for myself, but time and again sinks in the feeling that I just can’t keep up. 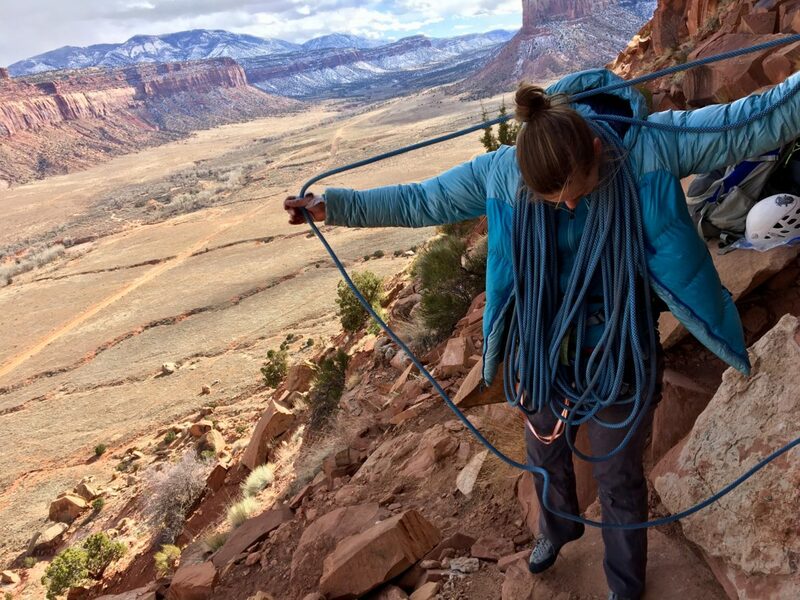 Though women are pushing the boundaries of rock climbing and comprise some of the greatest athletes out there, the climbing world is still fraught with pockets of toxic masculinity and a noticeable gender imbalance. The feeling of constantly trying to keep up with the boys and prove myself had been an undercurrent all week long. Today, after Jack and Ethan wandering off instead of supporting Charlotte, and my own failures with 5.11, it is too much to bear. Charlotte and I sit and talk for a few minutes; it’s female partnerships like this one that inspire me to keep climbing despite my fears and failures. I tell myself that I didn’t send Glitter Gulch because I hadn’t trained hard enough, and nothing else. It’s getting dark and we have a long hike back to the car. I wipe my tears and shoulder my pack. We have a few hours to squeeze in a final climb before catching a plane back east. Jack and Ethan decide to rest on the final day because their tendons are sore. Charlotte and I have other plans. 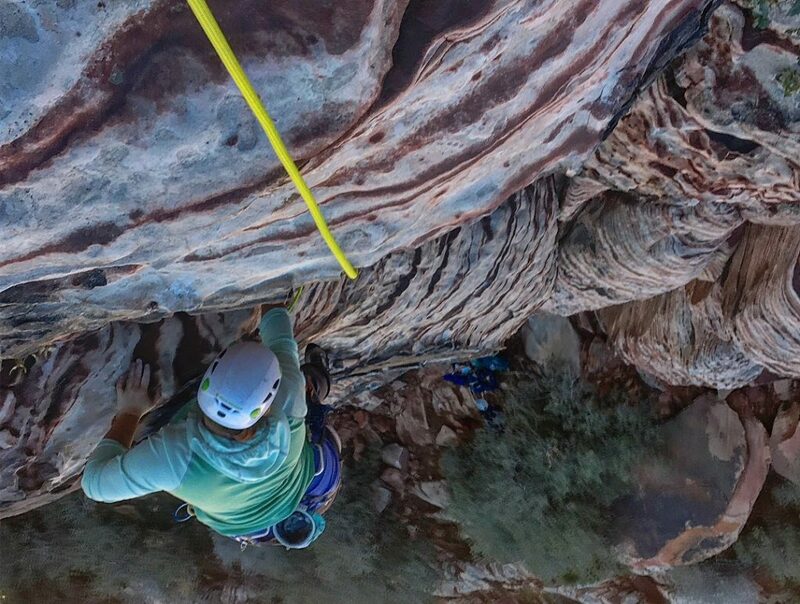 We leave Jack and Ethan at the car and make the long hike into “Big Bad Wolf,” a 3-pitch bolted 5.9 that is renowned as one of the most classic climbs in Red Rock Canyon. Although it is not too difficult in grade, Big Bad Wolf is a multi-pitch climb, meaning it is taller, longer, and will require more technical knowledge than all of the single pitch sport climbs we have been on all week. As soon as I take to the rock, I forget about yesterday’s Glitter Gulch debacle. My arms are tired, but I feel strong and fearless. I place my foot delicately on a tiny edge of rock and stand. Each hold feels custom made for my hands, and I can’t help but grin as I move upward. I build an anchor and belay Charlotte up to me. Midway up the wall, we sort our gear and then continue to progress up the route. At the top, we are jubilant. We are up so high that when a helicopter flies by, we look down at the blades from above and wave. The boys may have sent 5.11 before me, but they don’t yet have the skills to lead a multi-pitch route like this one. It’s just us girls up here, high on top of this cliff staring out over the sprawling desert and the buildings of Las Vegas. Any lingering frustration from yesterday melts away as I take in the view. Massive sandstone cliffs look like small boulders stacked below us, the striations in the rock like melted puddles of wax. Charlotte and I sit side by side on the summit for some time. The boys are tiny specks somewhere in the valley below us, but we girls are on top of the world.